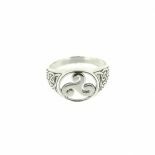 Show your love for Scotland with this highly attractive Sterling Silver Signet Ring. 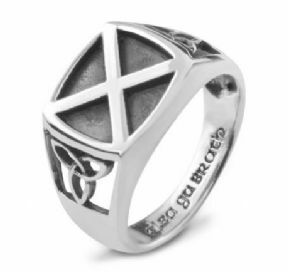 Featuring the Scottish Saltire, the national flag of Scotland, and enhanced with ancient Celtic Trinity Knots on the shanks, the ring is embossed on the inside with the words 'Alba Gu Brath' - gaelic for 'Scotland Forever'. 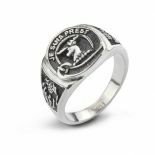 Crafted in the finest 925 Sterling Silver, it will delight lovers of all things Scotland, and the unique history and heritage of our small country. It is shipped to you, direct from Scotland, in a quality black and gold jewellery gift box. It will make an ideal gift, and a lasting memento, for yourself or someone you love. Available in sizes, from 8 to 14. Please select the size you require from the drop down menu above.